I use an interdisciplinary approach to investigate questions in sensory ecology, particularly visual ecology, at three levels: 1) the molecular level of the genes that encode vision-mediating proteins, 2) the anatomical level of structures responsible for capturing visual information from the environment, and 3) the behavioral ecology of individuals as it relates to sensory input. By conducting both lab and field experiments and combining data from the three levels mentioned above, I produce comprehensive comparative studies in visual ecology. My main study system to date has been nonhuman primates and closely related taxa. Compared to other mammalian orders, primates are highly visually oriented and exhibit a number of derived visual adaptations. Ultimately, my interest in the visual ecology of living species is conceived to better understand the adaptive origins of primates. Color vision is defined as the ability to discriminate between two visual stimuli that only differ in their spectral composition, independent of their relative intensities. For color vision to be possible, an animal needs to possess and use at least two types of cone photoreceptors, with different spectral sensitivities. The presence of one or more cone photoreceptors (and thus the potential for color vision) varies among nocturnal primates. Some species are colorblind, having lost a functional short wavelength sensitive opsin pigment gene. 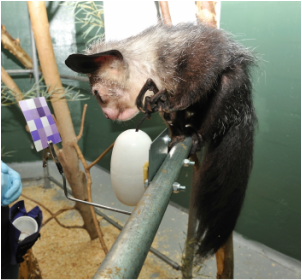 In other species, such as the aye-aye (Daubentonia madagascariensis), this opsin gene remains intact and is under strong purifying selection. This finding suggests that dichromatic color vision might be adaptive for aye-ayes even under dim light environments. The existence of two intact photoreceptor types, however, is not sufficient proof for color vision. To test whether cone-opsins are functional in dim light, I having been working with the Duke Lemur Center to determine the absolute threshold of light intensity at which aye-ayes can discriminate colors. My research has broadly focused on the visual ecology of non-human primates but I also have a keen interest in foveal anatomy and development. Foveae are widespread among diurnal vertebrates, but among mammals they are restricted to haplorhine primates. The fovea is also a common site of pathology in many human retinal diseases and yet relatively little is known about the mechanisms of foveal development. The retina of the night monkey (genus Aotus) has been studied since the 1870s and a rod-dominated fovea is either absent, shallow and rudimentary, or present in 10% of individuals. Accordingly, Aotus has been a model taxon for understanding foveal degeneracy. I am investigating foveal anatomy by utilizing optical coherence topography (OCT). Using SD-OCT, we can scan the eyes of fixed night monkeys and obtain high-resolution cross sectional images of the fovea and parafoveal regions. Ultimately, I plan to use in vivo handheld-OCT to also examine bushbabies (another taxon with somewhat confusing reports of either 'foveal specializations' or a 'visual streak'). Results from this comparative sample of night monkeys and bushbabies could potentially be used to investigate differential gene expression across the retina with established foveal cDNA libraries and correlate those with foveal development or degeneracy in primates.